In 1900 John Elfreth Watkins, Jr., author of many detective and mystery novels, wrote a piece for the December issue of Ladies Home Journal speculating about what the next hundred years held. Everything from weather control to pneumatic tube delivery to the science that will surely bring "strawberries as large as apples" were predicted. 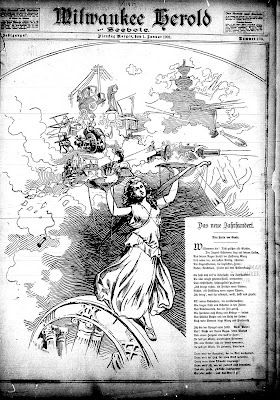 According to the book Yesterday's Future: The Twentieth Century Begins the Watkins article was translated into German for the Milwaukee Herold und Seebote (Milwaukee, Wisconsin) in 1901. 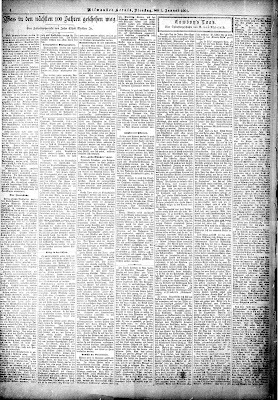 Above is a scan of the front cover of the January 1, 1901 Milwaukee Herold und Seebote newspaper and below is the article by Watkins. Stay tuned for an English-language translation and analysis. Another good example of very old futurism you might want to check out is Albert Robida's The Twentieth Century from 1882, which he both wrote and illustrated, a satirical depiction of the wonderful world of 1952. It featured flying cars (well, dirigibles), TV, feminism, technological warfare with tanks and submarines, and robots. There are some articles on the book here and here. I don't know about the article itself, but the illustration for the article is amazingly prescient... not that history has every been different. What a marvelously accurate summary of all of human history: in order to wage one (war or social advancement), you must steal from the other. And those scales are never quite in balance. Right now they are waaaaay out of balance. My German is slightly rusty, but as far as I can tell this article is either exactly or nearly the same as the Lady's Home Journal article.